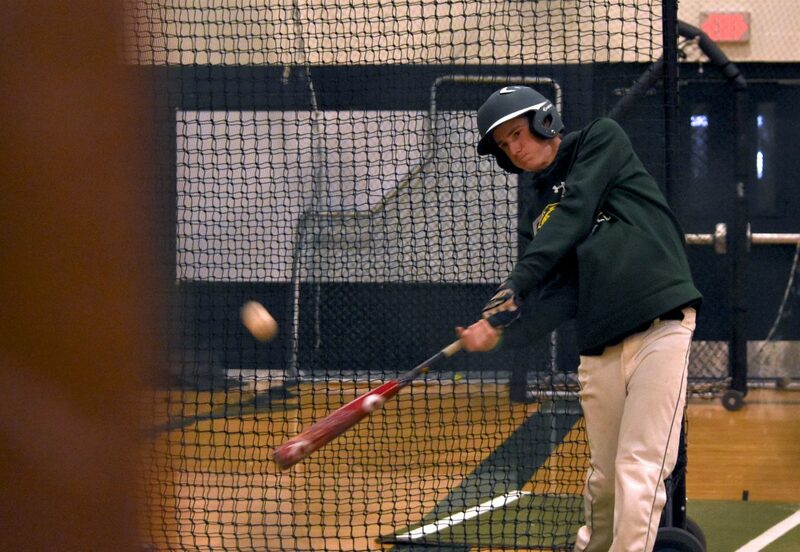 A Summit High baseball player takes batting practice in the collapsible netting at the school gym in early April. This year's team wants to pick up where the 2015 team left off and win 13 (or more) games for the best varsity record in program history. It’s already been a historic week for the Summit High varsity baseball team, and it’s not even Friday yet. On Wednesday afternoon, the Tigers traveled west for a spring doubleheader against Eagle Valley, one of the toughest teams in the 4A Western Slope at 7-5 overall and 4-1 in the league. The Devils are intimidating, but Summit arrived in Gypsum enjoying one of its best seasons in program history: At 10-2 overall and 5-0 in the league on Wednesday, the team was ranked No. 1 in the 4A Slope and No. 7 in the state 4A standings. And the boys had just completed a 2-0 doubleheader series against another league foe, Glenwood Springs, on April 8, before going bonkers at bat for a 22-2 victory against Englewood on April 10. This team has serious teeth. But the Tigers knew better than to underestimate the Devils and started the doubleheader with the big guns: senior ace Andrew Shaw, who leads the league in strikeouts (85) for a staggeringly low 0.81 ERA. Shaw was also having a big week — on Monday he committed to the baseball program at NCAA Division II Adams State University down south in Alamosa — but he didn’t let that shake his nerves, or even go to his head. Shaw struck out 14 batters in the first game, allowing just two hits en route to a complete game and the shutout win, 5-0. While Shaw led Summit on the mound, another recent college recruit, senior catcher Brian Hessler, led the team at the plate with three hits to load the bases at key moments. He’s taking the bat and mask to Division III Trinity College in San Antonio, Texas, for fall ball in August. Senior first baseman Jacob Payer shrugged off his slump for two hits, while junior two-bagger Max Hess also had two hits and added three RBIS in the win. Shaw wasn’t available for game two, but head coach Tom Looby and his team know how to work the road doubleheader system. They’ve been doing it for years, Shaw and Hessler said, and as long as the Tigers win the first game of the series, the team can be almost unbeatable in the final game. 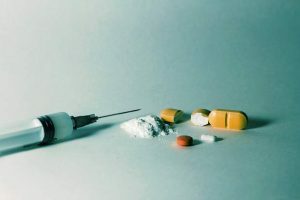 The second game was a seesaw battle, Looby said, with the Tigers battling back from two big deficits early and late for a high-flying, heavy-hitting 14-11 victory. This one was all about Summit’s six players hitting at or around .500: Hess, sophomore Ethan Drewes and senior Omar Nunez had three hits apiece, while junior Turner McDonald had four hits. Hess and Ethan’s freshman brother, Will, had three RBIs apiece. By sundown on Wednesday, the Tigers had improved to 12-2 overall and 7-0 in the 4A Slope — good enough for No. 6 in the 4A state standings and the best record in program history. Shaw, who along with Hessler rounds out the heart of Summit’s deep lineup, was relatively quiet in the second game. But hey, he’d just pitched a complete game with 14 Ks. It’s time to start thinking strategically about the post-season, because these Tigers are going. 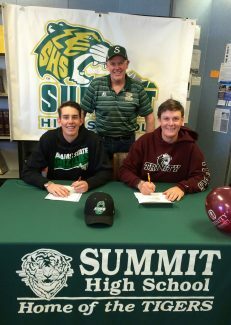 Summit High head baseball coach Tom Looby (center) with seniors Andrew Shaw (left) and Brian Hessler (right) after the two committed to collegiate baseball programs for the 2017-18 season. Shaw will play at Adams State in Alamosa, Colorado, and Hessler will play for Trinity College in San Antonio, Texas.